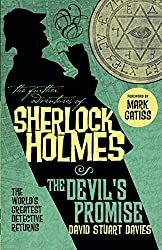 The full title of this book is The Further Adventures of Sherlock Holmes: The Devil’s Promise. The discovery of a corpse on a deserted beach is just the first in a series of mysterious and terrifying events that threaten Sherlock Holmes. While investigating the death, Holmes and Watson attract unwanted attention from the strange inhabitants of the nearby village, and are viciously attacked. Watson wakes to discover that months have passed and his friend is not the man he remembers. What has transpired during those lost days? And is it connected to the notorious “Devil’s Companion” whose descendants live nearby? I think that Sherlock Holmes is imperishable, a brilliant British icon – indeed a worldwide icon. He represents the best of us. He is as clever as we would all like to be. He is surprising, capricious, slightly dangerous, strangely elegant, dashing, Byronic and the best and wisest man any of us will ever know. I believe he lasts because we all want to be Sherlock Holmes and we all want to believe there are people like Sherlock Holmes out there, instead of the universe being completely chaotic, which is actually the truth. This fabulous character is the creation of Arthur Conan Doyle who, in my opinion, was a writer of genius. No wonder many of us wish to tread in his footsteps. Sherlock now lives in other people’s stories too, as he does in The Devil’s Promise, penned by the great Davies, whose Sherlock Holmes writings have brought me hours of pleasure. Holmes and Watson are staying in an isolated cottage in Devon when they they find themselves caught up in a nightmare scenario of a puzzling surreal nature they cannot understand. After Holmes discovers the body on the beach weird images appear on the door of the cottage, they are attacked by villagers, and meet a brother and his strange sister who warns them to leave or they will be killed. But I was a little disappointed; it began well but later became repetitive – the dead body disappears and reappears and Watson keeps getting into fights, being hit on the head and losing consciousness. It has elements of suspense, as Holmes is coerced to take part in a ceremony to raise the Devil. But I began to think it was all very predictable – maybe it’s the cynic in me but I found myself reading just to see how it ended and whether it was as predictable as I thought it was. And it was, apart from the very last three sentences. I am always wary when an author takes on the character of another writer. I have avoided Sherlock Holmes sequels up until now and your review makes me think I may have made the right decision. I usually avoid sequels by a different author, but this one looked promising. I should have known better! I haven’t read anything written by the |new” author, use to be quite a Holmes fan, not so much anymore. although I do love Elementary on T.V. I do like ‘Sherlock’very much but I haven’t see ‘Elementary’ – didn’t even know about it! I love Sherlock Holmes and it is really interesting to hear Mark Gatiss’ thoughts, as I think he’s great too. I’m sorry to hear this story was predictable. I am going to be really upset when I run out of Doyle’s original Holmes stories to read. Sequels by other authors can be disappointing. I do like the Laurie King novels featuring Sherlock and Mary Russell.